Selections from symposium “The Medical and Ecological Consequences of the Fukushima Nuclear Accident” New York March 11-12 by Helen Caldicott Foundation & Physicians for Social Responsibility. It isn’t over. Danger to women, children, wildlife. Radio Ecoshock 130320 1 hour. Last week I sent out by podcast a pathetic audio press conference from the New York City symposium. I called it “Poisoned Flag”. Two U.S. sailors tell their stories of being soaked with radioactivity aboard the aircraft carrier USS Ronald Reagan during the Fukushima nuclear accident in Japan. The sailors tell a harrowing tale of being exposed to radiation blowing from Fukushima, over a period of two months, as close as one mile from shore. They were not told of the accident until weeks later, were never properly tested for exposure, received no preventative treatment, and even now get no medical help from the Navy. Allegedly forced to sign waivers releasing the Navy from any responsibility, the pair are among more than a hundred American sailors suing TEPCO, the Japanese nuclear plant operator. If you missed that, find it on the Radio Ecoshock web site at ecoshock.org. Click on “past programs” and you’ll see this special news audio available for free mp3 download. This press conferences kinda says it all for the common person. We do not get support from the governments allegedly elected to protect our interests. It’s easy to see where we all stand when it comes to the military industrial nuclear complex: in the dark and in the radiation zone. In this week’s Radio Ecoshock show we hear straight from the conference “The Medical and Ecological Consequences of the Fukushima Nuclear Accident” held at the New York Academy of Medicine, March 11th and 12th. My thanks to the Helen Caldocott Foundation and Physicians for Social Responsibility for getting out the truth about Fukushima, about the on-going impact of the Chernobyl nuclear plant explosion, and the radiation still with us from atomic testing. We’ll hear scientists and activists explode the myths behind the catastrophe of March 11, 2011 at the TEPCO Fukushima Dai-Ichi nuclear complex. From speaker Mary Olson, you hear about the unreported higher impact on women, children and babies. We hear a report about disappearing wildlife at Fukushima and Chernobyl from Dr. Timothy Mousseau, Professor of Biological Sciences, University of South Carolina. Arnie Gundersen from Fairwindes, David Lochbaum from Union of Concerned Scientists speak out. Plus everything you wanted to know about Cesium, but were afraid to ask, from Dr. Steven Starr, University of Missouri. That leave me little time to speak. Please listen to the “Deadly Myths of Fukushima”. This is the huge lie politicians and power companies most desperately want you to believe. I present a clip from the Q and A period, from Akio Matsumura, Founder of the Global Forum of Spiritual and Parliamentary Leaders. Who is he? Lets just say Mr. Matsumura meets with world leaders one on one. As he tells us, when he was invited to dinner with the Japanese Prime Minister, the whole cabinet was invited to join them. What did he tell them? 1. Japanese children will be part of giant nuclear experiment for hundreds of years. 2. Nobody knows where the nuclear fuel has gone, or what state it is in. Government policies are based on wishful thinking, says Matsumura, because “Fukushima has no time”. That is, the radioactive threat will last and last, beyond us and our descendents. Then Kevin Kamps, Radioactive Waste Specialist for the non-profit group “Beyond Nuclear” demolished the “it’s over” myth when interviewed by Karl Grossman Chief Investigative Reporter for VVW Hamptons TV. You’ll hear some of that interview. See that whole series of Karl Grossman interviews at the 2nd year anniversary of Fukushima conference in NYC on You tube here. In just one of a thousand examples that the Fukushima accident is far from over, just listen to Arnie Gundersen of Fairewinds.com in that morning Q and A session on March 11th at the symposium. That’s right, 400 tons a day of groundwater is mixing with the loose hot nuclear fuel. The contaminated water is being pumping into hundreds of temporary holding ponds that are not rated to withstand an earth quake over 6.0. Fukushima gets lots of earth quakes. You think so? Think the next nuclear melt-down isn’t just waiting for the USA? Here are two quick clips from David Lochbaum, nuclear engineer from the Union of Concerned Scientists, again from that morning Q and A session. He explains the US Nuclear Regulatory Commission can’t even enforce the “no-brainers” like putting vents on the aging Mark I reactors (as every other country has done except maybe India). Or this one: why can’t the NRC force the California nuclear reactors to meet the fire codes? They’ve had about 25 years to comply, and still get granted more time? Lochbaum says Californians have won the nuclear lottery – they better hope their number doesn’t come up like Fukushima. This is one of the most important lessons of this symposium. A stream of scientists and investigators have found women, girls, and babies are far more sensitive to radiation than the 30 year old healthy male used to set acceptable radiation standards around the world. If you aren’t outraged about what you are about to hear, you aren’t paying attention. You get clips from a presentation by Mary Olson, Nuclear Information and Resource Service, Southeast. She spoke on “Gender Matters in the Atomic Age“. This talk March 11th is titled: “The implications of the massive contamination of Japan with radioactive cesium” by Dr. Steven Starr from the University of Missouri (and Physicians for Social Responsibility). Here is a bio page on Steven Starr and another one with some of his history against nuclear weapons. Find out everything you wanted to know about Cesium, but were afraid to ask. Yep, the kids get it first. Europe and Japan are loaded with Cesium from Chernobyl and Fukushima. A nice dusting hit the American West coast in 2011 too. Cesium never goes away, even though the news media stops reporting on it, and the government stops inspecting food. Dr. Tim Mousseau, Professor of Biological Sciences, University of South Carolina. We hear a ten minute excerpt from his talk “Chernobyl, Fukushima and Other Hot Places, Biological Consequences”. The story that Chernobyl has become a wild Eden after the accident was founded on zero scientific studies. Mousseau and his team did the studies. 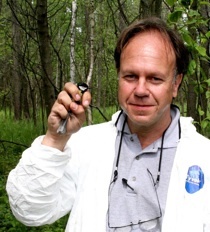 They found one third fewer birds even 25 years after the Chernobyl accident. Many fewer insects and species of insects. There are so few mammals that the Ukraine had to install a petting zoo, to provide for the Chernobyl tourists who came to see all the famous wildlife (but they don’t see any). Same again in Fukushima, except the spiders there are doing better, now that there are so few birds to eat them. Radioactive “Eden” isn’t going so well, and won’t for hundreds of years. Some so-called “experts” in the Ukraine and elsewhere in the nuclear establishment tried to suggest the growing death rates after Chernobly were only due to alcoholism or psychological stress. It’s important to find out what happened to the wildlife, who apparently don’t smoke or drink. We don’t know if birds were psychologically depressed on reading news about the Chernobyl accident, but somehow I doubt it. Mousseau blows up that whole argument, and gets us outside the human-centric paradigm. As Helen Caldicott says, we humans are not the only living things with genes to be damaged by nuclear mistakes. As mainstream media fails to report on this frightening new science of nuclear accidents, we have to depend on independent producers. In coming shows, Radio Ecoshock will bring you more from the conference. Maria Gilardin of TUC Radio San Francisco will also bring you more, at tucradio.org. Another stalwart of nuclear truth telling is Robert Knight, host of 5 o’clock Shadow on WBAI New York. We’ll hear directly from Helen Caldicott speaking at the NYC conference next week on Radio Ecoshock. She promises that a book with the full proceedings will be available in the next 6 months or so. That is very important for the record, as these things get buried so quickly by the pro-nuclear lobby and the mainstream media. I’m Alex Smith. We are out of time. Join us next week. Please help pay for this program if you can. Make a donation from our main blog at ecoshock.info – or subscribe to the show with easy monthly donations at our web site. Thank you to all those listeners who make Radio Ecoshock possible. She provides an overview of nuclear energy, its effects, and whats happening now.